GPU Shark 0.9.11 brings the support of the latest GeForce GTX 1080 Ti as well as Radeon RX 580, RX 570 and RX 560 (based on Polaris 10/11 GPUs). The GPU monitoring library behind GPU Shark has been updated with the latest version of NVAPI (R378). GPU Shark 0.9.11.4 improves the detection of recent AMD Radeon cards (RX 580, RX 570, RX 480 and RX 470). 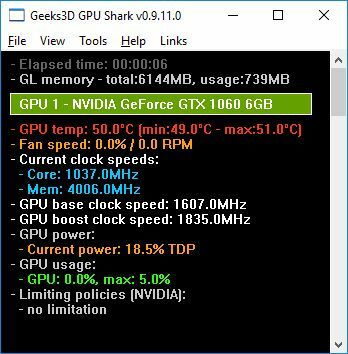 GPU Shark 0.9.11.3 adds the support of NVIDIA TITAN Xp. GPU Shark 0.9.11.2 improves the detection of AMD Radeon GPUs on some systems with Intel iGPU. GPU Shark 0.9.11.1 brings the support of Radeon Pro WX 7100, WX 5100, WX 4100, WX 4150 and WX 4130.